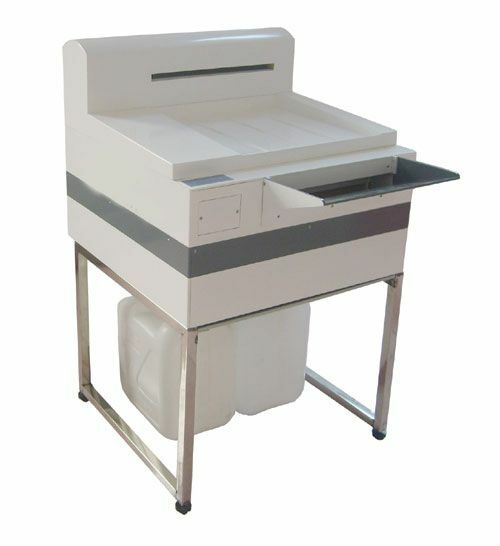 The working principle of Film Processing Machine: The Film Processing Machine consists of processing,fixing,washing and drying.to ensure the quality of process and efficiency,the working of Display,fixing and washing consists of deep groove and drive architecture;Drying system includes far-infrared quartz heating elements and a pair of long standing fan dryer,in order to ensure the film to be dry in a short time of process and reduce the space,All rolls,wheels and dryers in wet situation are driven by an AC motor horsepower.Before processing the film,the first thing is to connect the power,processing machine is working with electric.Reperfusion pump,to reach the desired level,desired working temperature of the dryer and the processing,and then the processing machine is in a pending state,only a drying fan and circulating pump are still on working situation.During process of the film,at first,the drags of the film mounted on transmission panel are detected through the sensor switch,when the film is detected ,the processing machine are into the processing system and active the transmission system,drying and heater system and the fan,meanwhile pending for lights up ,untill the drags of the film are detected by sensor switch,after about 10s,the lights will be off,and sound signal is ringing indicating that the next film can be input.The film is input though transmission wheel mounted on the film processing tank,the drive roller transfer the film through the process tank,the excess liquid will be cleaned by output rollers while the film leaving away,this process is repeat in fixing,process and drying progress,the electronic control circuit will maintain the processing working for about 4min after the the washing machine turn off ,to ensure that the film is completely processing.The well-processed film is to be transfer to the output area at the top of the processing machine ,thereby the processing and the dry is complete. Maintenance of the processing machine is divided into daily clean and check,weekly clean and check,monthly clean and check and annual maintenance and check. Daily clean and check :cleaning the shelves of the processing and fixing,the cover and the top plate. Weekly clean and check: cleaning the shelves of the processing and fixing,do full inspection for the shelves to ensure that the roll rotate freely ,use sponge and non-metallic and non burr mat to clean outer surface of the rinse tank. Monthly clean and check: should arrange 2h to thoroughly clean the developing,fixing and washing systems.After a thorough cleaning,inject clean warm water into the the tanks of developing and fixing.and then install the turret.Connect to the power,to active the transmission and circulation system continuously for 15min,and then do the final cleaning,checking whether there is a foreign object,and fill the tank with clean warm water and drain off the water.To ensure safely,check the catheters fixed bolts of the display,the fixing and flush pump,and the water leak situation of the pump base. check on each drive gears of shelves and replace worn and damaged gears,adjust the main drive belt,check and clean the display,the fixing reperfusion system,add oil in the lubrication places. Learning the operation and maintenance of automatic film processing machine can extend the life of the processing machine without fault,ensure the normal operation.Therefore,we should seriously follow up the requirements.